I thought I knew what Jane Austen meant in Emma when she wrote that Jane Fairfax’s visit would last until Midsummer. She meant Jane would be there before the middle of summer, right? No. Midsummer actually falls at the very beginning of summer on June 24, around the time of the summer solstice. Midsummer had long been celebrated in England. 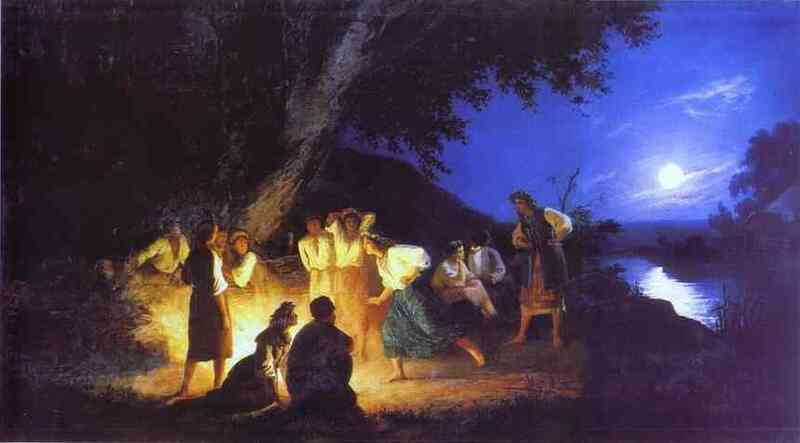 Pagans claimed that evil spirits wreaked havoc at Midsummer, and people partied all night beside protective bonfires. Shakespeare portrayed Midsummer as a Freaky Friday sort of occasion, in which societal mores turned topsy turvy. By Jane Austen’s time, however, things had changed. Christian reformists made over the holiday to celebrate the birth of St. John the Baptist. On St. John’s Eve, Christians sometimes still lit bonfires, but they fasted instead of feasting. The feast occurred during the daylight on the following day. Midsummer was one of the English quarter days during Regency times. These quarter days marked both significant religious holidays and financial bench marks. Contracts began and ended on quarter days. They were also the days to pay rent and hire servants. Hence, Jane Fairfax planned to stay in Highbury until Midsummer when the Campbells would arrive home from their time in Ireland. Other than Midsummer, Jane Austen observed three other quarter days. Lady Day, which celebrated the Annunciation to the Virgin Mary, fell on March 25. Christmas, which celebrated the birth of Christ, fell on December 25. You’ll notice that the quarter days roughly coincide with the Spring equinox, the Summer solstice, the Autumn equinox, and the Winter solstice. Curiously, Jane never mentioned Lady Day in any of her novels. Instead, she used Easter to mark the beginning of Spring. In modern times, some groups of Europeans still light bonfires to celebrate Midsummer. Have you ever been to a midsummer bonfire? I hope Jane Austen enjoyed her revels when she took part in these pagan Bacchanalias! What an interesting post, Rebecca. I did not known about the quarters, though I had seen Michaelmas mentioned plenty of times. I love it when I learn something new that will help me with my writing. Thank you! I love these type of clarifications. I think that help the U.S. based readers better to understand the little nuances of the Regency period. Thanks for sharing the information. Thank you, Regina. There is so much to learn about history. Hopefully, other people can benefit from my little discoveries. My son went to a bonfire last week, and it was held in one of those little backyard fireplace things you buy at the store. So, I guess even the definition of bonfire has changed. Go figure. Thank you for this interesting post. No I haven’t been to a Midsummer bonfire. You’re welcome. There’s still time to have a Midsummer bonfire this year. I have heard about quarter days before, it might have been your previous post. That is interesting. Thank you for sharing. I thought they were to move in by Michaelmas. I had to look up when that was as I had no idea (turns out its 29 September for those who don’t know either!). It’s so odd to think midsummer used to be such a big celebration as in the part of the UK where I live there is no celebration of it whatsoever, though I’d like to think it’s marked elsewhere. Interesting that it was one of the quarter days. You hear those mentioned in novels but I never looked up when they were. Oh, man. I messed that up. I’ll have to correct my post. Thanks. Okay. I fixed it. I must have misread my notes. Thanks for catching that for me, Ceri. Yes, Michaelmas was a huge deal back then, and it seems to have been forgotten too. Funny how things change over the years.